We have created a exclusive networking website just for you! CEO students, alumni, facilitators, CEO board members and CEO investors!! Midland Institute for Entrepreneurship has officially launched our private CEO social platform, which now connects CEO communities and all stakeholders throughout the nation. The purpose of CEO Connect is to provide an intentional platform for CEO stakeholders (students, alumni, boards, investors, facilitators) to maintain relationships as well as create new interactions and networking opportunities. Ultimately, CEO Connect is there to assist in building a stronger community for CEO programs both now and in the future. Check out the benefits of CEO Connect for each type of stakeholder. 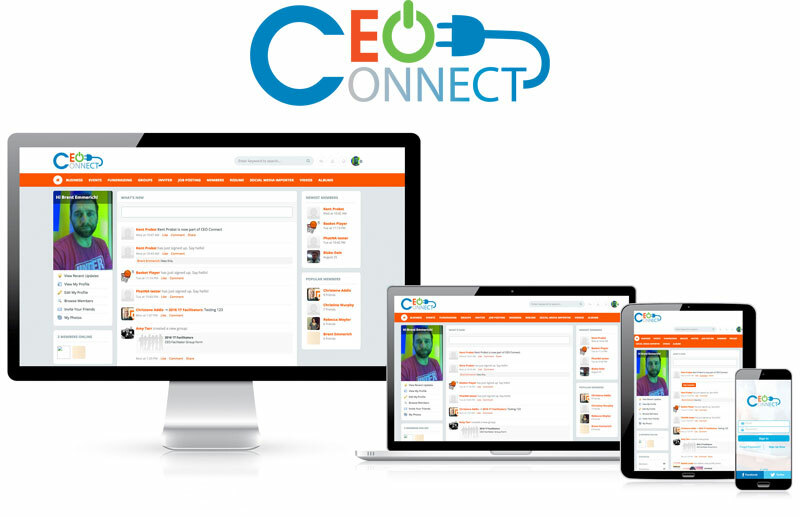 Utilizing the CEO Connect group feature, connect members are able to invite their friends to join CEO communities and their groups. This feature is great for facilitators to post daily activities, upcoming events, news, special announcements, etc. to their entire CEO community, keeping their individual network engaged. CEO Connect group is also a great way for alumni to stay connected within their CEO communities during and after their CEO experience. With CEO Connects Job posting feature, CEO Connect is now also a place where investors (companies), mentors, board members, etc. can look for talents, create a company, post, and share job listings. For other members, they can apply for jobs, follow or favorite a company. The Business Directory feature within CEO Connect allows members to create a business or claim a business created by other members. CEO Connect members are able to review and rate any business with which they have had experience. This feature will help provide exposure to a business and can potentially help convert leads into clients. Since the development of social network, it has become not only a part of people’s life, but also an integral part of business development. CEO Connect offers “Resume” as another tool for users to promote themselves, to endorse their skills, their achievements and their professional experience. Members can also import their resume from LinkedIn. CEO Connect offers a unique fundraising feature that gives members a hand in financial aspects of their business. If you are nursing big ideas but have to give up because of shortage of expense, the CEO Connect Fund Raising feature can help. Connect members now have the capability of creating free campaigns to assist in bringing their ideas to life through donated money. Connect members will also be given a source code to be embedded to external websites. It will bring the campaigns to more people and as a result, more money will be donated. Live Chat on CEO Connect allows all users to enhance their conversations within moments by sharing photos, videos, links, and especially emoticons. With a full set of smileys, there is a right one for every mood! CEO Connect offers one of the most convenient video-sharing tools which allows users to stream videos from YouTube, Dailymotion, and Vimeo right on their profile. This tool offers many features for Connect members to be a popular video service whereby users can create video clips and share them to the masses.